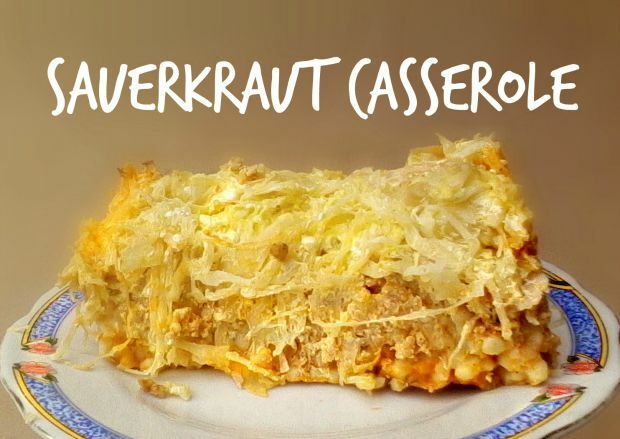 Today I’m gonna share a sauerkraut casserole recipe! But on the bright side, it’s really delicious and filling. It’s probably not the healthiest recipe of mine, but I promise, worth to try! 1. Heat a little oil in a larger pan and add the egg barley. Stir it constantly and saute for a few minutes (2-3), it’ll turn golden brown. Pour the broth onto the barley (be very careful with the steam!). Stir it from time to time (it maybe stick to the bottom), and cook it for 15-20 minutes or until broth is absorbed. 2. In a saucepan, heat a little amount of oil and saute the minced meat. Add the seasoning and cook for 10-15 minutes until it turns greyish. 3. Mix the eggs and the sour cream in a mixing bowl. Add a little salt and pepper to the mixture. 4. Pre-heat the oven. When all the ingredients ready, start layering them in a casserole. First the egg barley/rice, next the meat, then the sauerkraut and last but not least pour the sour cream mixture onto the sauerkraut. Bake it for 20-30 minutes or until the top of it turns golden. I made it for dinner, but it perfect for lunch too. Also, it’s freezable, so great make-ahead meal.